Scary tentacles | Thinking is the enemy. ← Whistle while you work? “Robert Gordon – It Came From Beneath the Sea (1955)” by Kamil Antosiewicz Monika Powalisz is licensed under CC BY 2.0. I’ve been thinking about tentacles this week. More specifically, cephalopods like the octopus or squid. Cephalopods feature prominently in some of my favorite movies: Ed Wood, 20,000 Leagues Under the Sea (Michael Caine or Kirk Douglas, they’re both great), and even the Watcher in the Water outside the Doors of Durin in The Fellowship of the Ring. Of course, the last two films were based on books by Jules Verne and J.R.R. Tolkien, respectively. 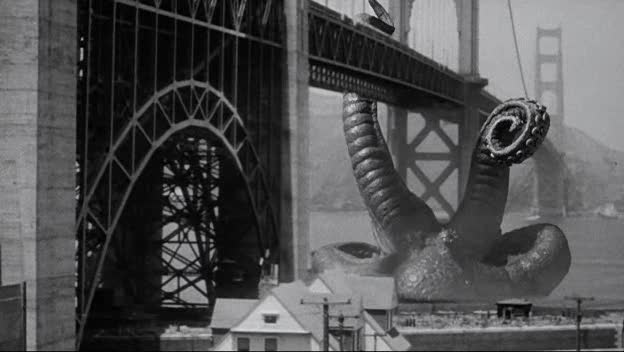 And there’s a whole slew of bad movies (and good bad movies) that also feature cephalophods, like It Came From Beneath the Sea, in which a giant octopus tears down the Golden Gate Bridge and basically tries to eat San Francisco. So why have I been thinking about cephalopods? They’re scary, that’s why. At least for me. Figuring out what scares me is an important part of my writing process. If I know what scares me, frightens me, horrifies me, gives me the shivers, then I can scare my characters — and perhaps my readers too. Fear can be a very powerful motivator, and the reason behind all kinds of actions and behaviors. One way to find out what scares you is to just make a list, or a mind map. One fear leads naturally to another, until you end up with a page full of frightening things. This entry was posted in Tentacles and tagged cephalopods, mind map, movies, octopus, squid, tentacles, writing. Bookmark the permalink. Chris, I agree. I think knowing what scares your characters is a very important piece of constructing a believable character. It can tie in with vulnerability , too, and help provide a character flaw. Yes, not to mention the Cthulhu Mythos.